10 Year Warranty. 100 % Recyclable. The classic 40/4 chair is an icon of modern design and one of the most striking designs of the 20th century. Distinguished design, uncompromising comfort, and extraordinary durability do not need to be sacrificed for convenience. 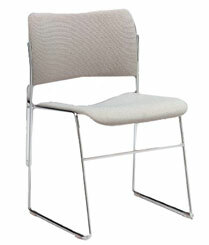 Upholstered Chairs have 5/8" of seat foam and 1/2" of back foam.